BANGI, 16 May 2014 – The still unresolved mysterious disappearance of MAS MH370 left many questions unanswered but it also has shed some light into issues such as security, the media, international relations and the psychology of Malaysians as a society. These issues were discussed at a forum titled “Under reported dimension of MH370” here today organised by Institute of Malaysia & International Relations of The National University of Malaysia (UKM). MH370 is about more than just a plane that went missing as it tested Malaysian Government’s ability in galvanizing international support for the search and rescue mission. This could not have been done without Malaysia’s strength in diplomacy, said Prof Dr Ruhanas Harun from the Malaysian Defense University. 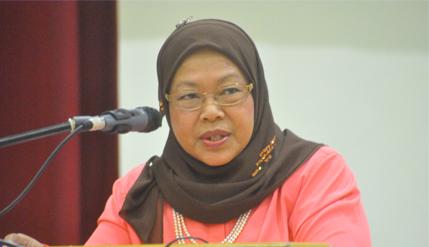 She said there were a lot of political issues such as sovereignty and political differences that arose but the Malaysian Government was able to tackle them. Prof Ruhanas, however, admitted that there is room for improvements as it shows that the country’s security is not iron clad as there are flaws that needed to be remedied. She gave the example of the military detecting the plane going off course but did not take any action mainly because they were following strict protocols and was not obliged to take action. She compared the incident to humanitarian disaster and how countries came together to lend a helping hand. However in the case of the missing MH370 there were many political issues including security that came into play at the international level. Prof Lee Poh Ping an expert on China studies from University Malaysia gave an analysis on how it affected Malaysia-China relations. Despite accusations that Malaysia was not telling the whole truth and was inefficient, Malaysia is important to China. It is Malaysia’s biggest trading partner and China does not want Malaysia to become more pro America than it already is. Malaysia is important to China because of its strategic location. The Malacca Straits for example is the route for China’s much needed supply of oil that fuels its economy. Yet some sources have reported that the number of Chinese tourists had diminished by 30 percent, since the incident. He dismissed the conspiracy theory that Flight MH370 went down because it was carrying secret American drone technology to China. Prof Zaharom Nain from Nottingham University Malaysia did not mince his words when he speaks about the media and MH370. He said that because of the country’s grip on media freedom with legislation, most journalist are reduced to note takers and feeding what is said by the authorities. Some mainstream media which is owned by the cronies of the government do not help either. Journalists are prevented to asked tough and the right questions. It is an open secret that journalists who present facts which is not favourable have had their story spiked or completely rewritten. So journalism in Malaysia is no longer a profesion but is now a vocation, he said. Because the authorities are so used to docile and subservient journalists it had created a Public Relations disaster at the international level to the extent it did not know how to deal with the international media under tense situation. Their lack of competency in handling the issues had opened it to a lot of criticisms by the foreign media. Director of Psychology Department in The Public Services Department Prof Dr Abd Halim Mohd Hussin also had issues with the media. He was tasked to look after the psychological health of the next of kins saying that the media had harassed them for interviews. They are suffering from an ambiguous loss which is not something like a normal loss where psychologically a person goes through the grieving process and later came to acceptance. Ambiguous loss is when a person suffers a loss but still banking on the hope that the loss will be reversed. It is like living in agony but hanging on to a tiny thread of hope. And when the media go to them asking questions like “how do you feel”. They are asking the families to relive their loss over and over again. This is very damaging to the next of kin’s psychological health, Prof Abdul Halim said. It was such that at one time he received a call from one particular woman who begged him to stop the media from going to her house. She was just recovering from the trauma and is trying to cope with her loss. The forum ended with everybody agreeing that there were weaknesses that needed to be dealt with in the various aspects of the incident. Present at the forum was the President of Malaysia Social Science Association and Director of IKMAS Prof Dr Rashila Ramli.